Wedding Anniversaries are a special time to send a card. Here is a list of the themes associated with each year. Your card can be made with any these in mind with some spectacular results. 1st. Cotton. 2nd. Paper. 3rd. Leather. 4th. Linen. 5th.Wood. 6th Iron. 7th Wool. 8th. Bronze. 9th. Pottery. 10th. Tin. 11th. Steel. 12th. Silk. 13th. Lace. 14th. Ivory. 15th Crystal. 16th Topaz. 17th. Amethyst. 18th Garnet. 19th Aquamarine. 20th China. All these years can generate some great ideas to be used on your cards, and knowing the themes will help you with your plans. For instance with the long standing years they speak for themselves. This is one I made for a Pearl anniversary. I kept the theme in ivory and added some flat backed pearls on the heart. The flowers are in cream, as is the velvet ribbon on the spine. But this card could be used for any of the dates. The peel offs are in silver so it could be used for 25 years too. Bow Front Card and leaving out the acetate front. 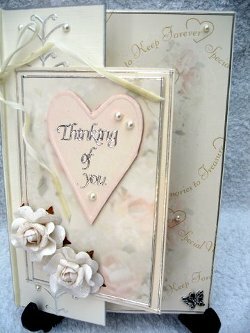 Then I have made a Big Card base and added the Bow Front Card to it. I have used a Specialised card in gold and wrapped the cream organza ribbon around the spine. The cream flowers have gold centres, and the peel offs are gold. 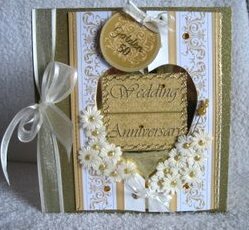 Make your card in any color you wish to suit the anniversary. Add ribbons that correspond to the theme, and add flowers with the same thought. Add coloured gemstones to match the year too. Both of these ideas for Wedding Anniversaries could be adapted to fit any, it really is up to you. adds the finishing touch to your creation.